The most fundamental truth about trading is that your opponent is YOURSELF. The majority must be wrong because they are the fuel that propels the market. The market enters a flash-type crash when the vast majority is LONG and they try to sell but there is no bid. Far too many people demonize trading such as “paper gold”, arguing that it is not real. Yet, eliminate futures and you get liquidity and then gold’s value would decline, not rise. Without a common exchange, gold has no value. What gives gold any value is the fact that it is accepted as having some value. If you cannot determine a value, no commodity, stock, bond, or object could ever have a value. This is a barter economy where you will NOT trade unless you need the item in exchange or know for sure you can exchange it with a third party. To avoid getting caught at the high or the low, you must understand the nature of markets and how they function. Once you accomplish that realization, you will see your real opponent is YOURSELF, not the grand cabal. The majority must be trapped at the high, which then creates the panic when the majority tries to sell but there is no bid. Likewise, at the low, the majority is bearish and the dominant trade is being short. They try to buy back, causing a panic to the upside for the lack of offers. 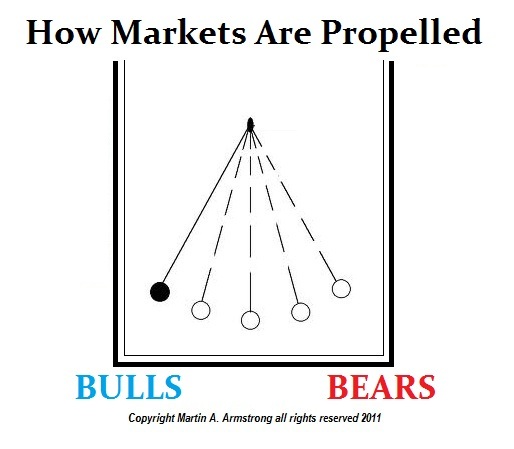 It is a pendulum swinging to the extreme on both sides which propels the market movement. I have stated that gold would bottom only after it become a dirty word. All that yelling and screaming about manipulation, or whatever commodities are in a declining DEFLATIONARY trend. Even egg prices have declined on the DCE futures exchange in China. The claims that China will back its currency with gold would not be bullish for gold, it would be a disaster, for the Chinese would not buy gold anymore and that would further the deflation as we see under austerity in Europe. Claims that money should be tangible would benefit the bondholders at the expense of the people just as we see in Greece right now. Analysis is the very same problem. I am not some guru, wizard, prophet, oracle, or whatever. I’m just someone who has been fascinated with understanding how things work. I use the quantitative modeling to allow the market to speak its mind and that is the best forecaster you can ever imagine since the market is never wrong. For those who have recently joined us, keep in mind that there is a huge difference between OPINION and real FORECASTING. Professional institutions follow us for what the computer says, NOT because I personally have never been wrong. No one’s OPINION is never wrong. Real money will NEVER trade based upon someone’s personal OPINION. The talking heads are for retail, not professionals. A central bank recommended to a very major pension fund that they call us – off the record. I spoke to the head and the first thing out of his mouth, “We do not have any respect for academics. We are calling you ONLY because the central bank wanted us to give you a call, which of course was off the record.” When I responded we were not academics, had real management and trading experience, and used quantitative models, the air was cleared and we began on the project. Real money does not listen to OPINION. It just cannot. At our World Economic Conference, it is NEVER a solicitation to sell you something. It is NEVER “I think” it is ALWAYS “Here is what the computer is showing in this market or that one.” We correlate the world and show you the connections. 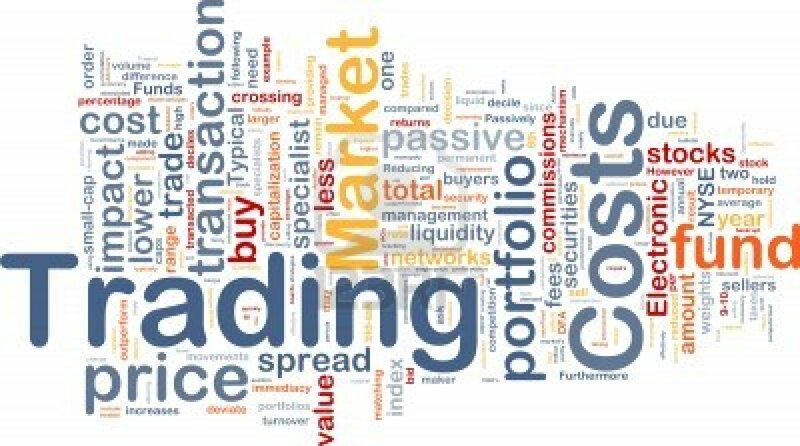 This is a learning experience; only then will you have the courage of your convictions to beat yourself in the trading game. You can read Spiral Panic to grasp the concept of trading in a market decline. But I also recommend that you begin reading our Models & Methodology so you can grasp a better understanding of forecasting model design.